Amrith Bdr Subba's Diary|: On the 205th birthday of Louis Braille, the bringer of light for theblind! On the 205th birthday of Louis Braille, the bringer of light for theblind! Today, the blind communities across the globe are together in spirit to observe the 205th birth anniversary of Louis Braille, the genius who has touched the lives of all the visually impaired people of the world. It was he who invented braille, the tactile system of alphabets used by blind people across the world to read and write. It’s through braille that the visually impaired people have accessed literature and pursue studies for over 200 years now. Braille is a tactile system of six dots in a 3X2 grid used to represent letters, numbers and symbols in many languages in the world. I sometimes wonder if there was no such a thing as braille, no blind would have got the opportunity to go to school even in Bhutan. Today, we have the alternative means of learning with the advent of advanced computer technologies but during my time, such technologies were not there. So on this special day, I must confess that I am extremely grateful to him for his great creation and we feel fortunate that he was born much earlier than us. Louis Braille was born in a small town of Coupvray near Paris in France on 4th January, 1809. He became blind at the age of 3 after he accidentally injured one of his eyes with a sharp awl while trying to help his dad in his harness workshop. With the passage of time, the infection spread to the other eye too and eventually he became totally blind. But in many ways, his loss of sight came as a blessing in disguise for all the visually impaired people of the world, especially those born after him. He did not stop going to school though. He learned only through listening to the lectures of his teachers but that posed a lot of challenges. He was always trying to think of a suitable system for the blind to read and write. At the age of 10, he was awarded scholarship to study at the Royal Institution for Blind Youth in Paris and it was here where he could make his dream come true. At the age of 12 in 1821, a former soldier Charles Barbier visited his school and shared with him about what he called ‘night writing’, the 12-dot code which he had invented as a means of communicating secret information among soldiers. It was from here Louis began to really work his brain out. For the next 3 years, Louis worked intensively on modifying this 12-dot system and making it easier to understand and use. He eventually reduced this 12-dot code to 6-dot code in a 3X2 grid and hence, the braille was born in 1824 when Louis was 15-years-old. Since then, he continued modifying and refining the codes but it was accepted as a standard writing system only after his death in 1852. It made its way to the outside world only from 1868. Today, it’s universally used by visually impaired people in the world. 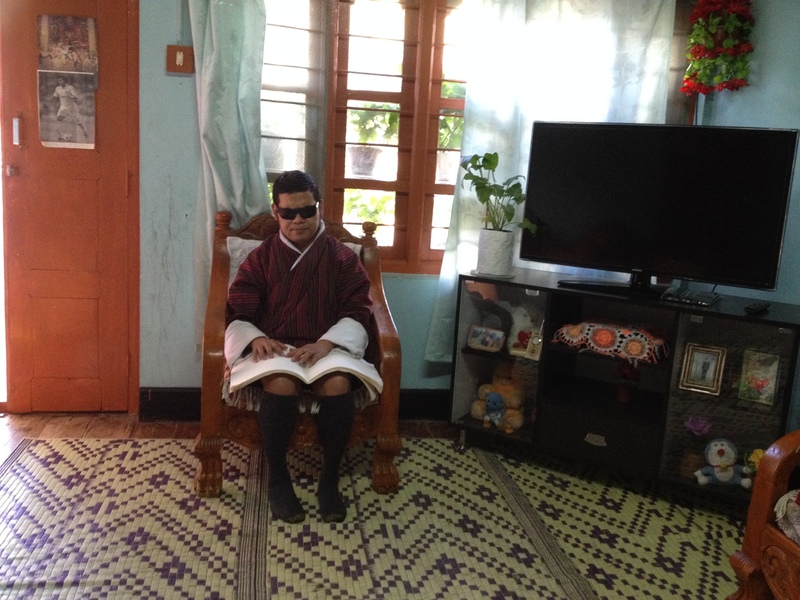 Having said so, braille has become an integral part of the daily lives of visually impaired people not only in other countries, but in Bhutan too. However, it’s quite sad that many of our policy-makers have not yet realized the full use and benefits of braille for the blind. We don’t get any official publications or for that matter, even newspapers/magazines in braille in Bhutan. During the 2008 elections, it was very kind of the Chief Election Commissioner of Bhutan, Dasho Kunzang Wangdi to provide us at least the voter education guide in braille. It was a great initiative. I am just wondering for how long we can keep on ignoring the needs of readers with disabilities saying that the provision of materials in accessible formats such as braille/large print is going to be expensive and that we cannot afford to produce them. I wish if some organizations come up with the initiatives. The use of braille is not only limited to reading materials. It can also be imbedded into our daily lives. In Australia, I know there were braille labels everywhere in public places: on the elevator switches, toilet doors and other important locations. It’s very handy for the blind to navigate around and get a sense of what it is and where he/she is. I wish we also get such facilities here in Bhutan someday.